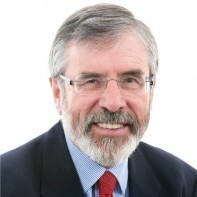 Sinn Féin President Gerry Adams is hoping to win election as a representative for the Louth constituency. Until recently, Adams was a member of both the British Parliament and the Northern Ireland Assembly but resigned both seats to concentrate his efforts on winning a seat in Dáil Eireann. Adams was first elected to Westminster in 1983 and was appointed as the party's president that same year. In a recent interview with The Guardian, Adams declared that he expects to see a united Ireland in his lifetime - “depending, of course, on how long I live." Where are the disappeared? A more important question this man will not be asked. Adams’s membership of the IRA is irrelevant. He was their mouthpeice, excused all their actions and defended both mass murderers and serial killers. Witness his welcome for the Balcome Street bombers. I cannot vote for a party that only began denouncing republican terrorism in 1998, and only then because they had signed the Good Friday agreement. Neither can I understand why a convicted gun-runner and traitor to his country such as Martin Ferriss has been allowed stand for the Dail. Anyone convicted of such a serious criminal offense should not be allowed to stand as a TD. We have enough criminals as it is. We hardly need an apoligist for such criminals in the Dail. Fair play to you Gerry. I honestly hope you can make a difference, for all our sakes. That said, I would be two faced if I failed to point out that we are rejecting the current establishment for refusing to tell the truth to the people. I hope you find the opportunity to come clean about your past so that we can all move forward giving you our full support. In relation to a united Ireland, I sincerely hope so. But let’s take it one step at a time. We can’t afford 26 counties at the moment, never mind 32!